MY HAND LUGGAGE & TRAVEL ESSENTIALS, A COLLABORATION WITH MARC B.
I can't remember the last time I was able to travel with just a handbag for hand luggage, I've been moving around so much lately that I usually need all the space I can get which means more 'wheely' suitcases for me! When I get the luxury of being able to just use a bag for travelling (or the airline lets me get away with both) it makes flying more enjoyable in that I can have everything I need under the seat in front of me, and usually once I get to my destination I can just head straight back out with my bag. 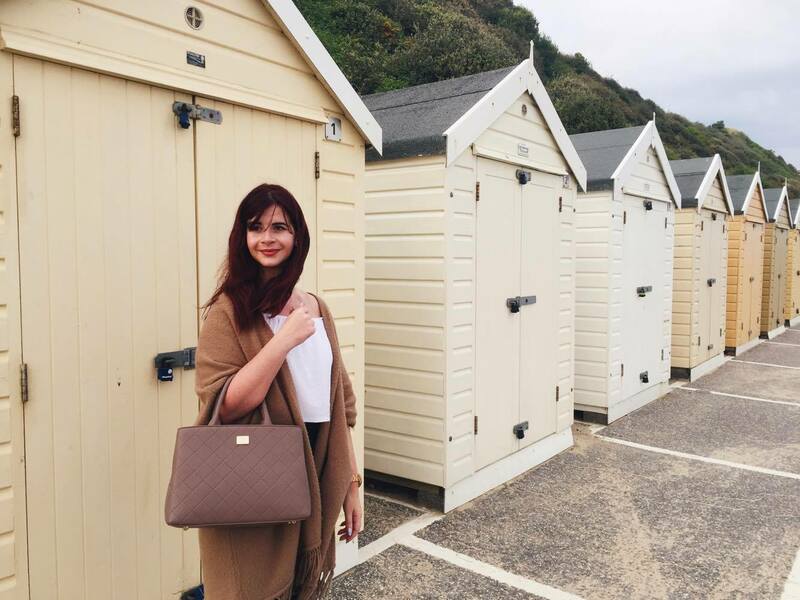 Marc B kindly sent me their cherrybrook mushroom handbag for all my travelling essentials - here's everything that comes along with me when travelling! Unless you're planning on taking a small suitcase with you too, then a tiny bag is pretty pointless unless you're flying for an hour, need no entertainment and simply flying home. This Marc B bag is the perfect size and features three compartments including a zip pocket in the middle meaning you can keep all your important documents secured there. This particular bag also comes with a long strap if you wish to hang it over your shoulder or wear it cross body. If I'm on a short-haul flight and have no entertainment system then this is always good for watching Netflix (yay for downloadable shows!) and writing up blog posts or university assignments. If you're on a long-haul flight check out my blog post on how to keep yourself entertained. 9/10 times I forget to charge it, so then it becomes pretty useless. This is a must when I'm travelling anywhere out of Gibraltar because the chances of me using up all my battery when listening to music and watching old videos on my phone are high. If not I'm then the idiot who has to sit in Gatwick Airport waiting for my phone to charge before I can get on any train (don't forget your chargers either). I find time goes quickest on a flight when I'm lost in a book, check out my Instagram for what I'm currently reading! I wish my kindle still worked cause it's a lot more handy when travelling and takes up a lot less room, but alas the battery gave up on it. For when reading small words with no pictures starts to become a challenge. I bought one of these from accessorize years ago and it comes with me everywhere! They're so handy for keeping all your important stuff in one place and not crumpled at the bottom of your bag. If you have a friend who likes to travel, this would make a great gift! I tend to travel foundation free because then my face just ends up feeling sticky after an hour in flight. Travel sized items are always the best for this. For when you spill your in-flight meal and the flight attendant is on the other side on the plane. Necessary on a long-haul flight unless you're going for the dewy look. 10. A notebook (and pen). I usually tend to journal most when I'm flying cause I have nothing else to distract me, or use it as an opportunity to write down an abundance of lists. I find it hard to fall asleep when I know people can see me, especially because my mouth ends up opening when I doze off. Plus if the person next to the window doesn't want to shut the window, then no problem. what are some of your favourite travel essentials? I'd love to know if you guys have any trips planned soon! These are all the same things I take travelling too! Wipes and hand sani are life savers and I am exactly the same when it comes to my portable charger, forever forgetting to charge it!! 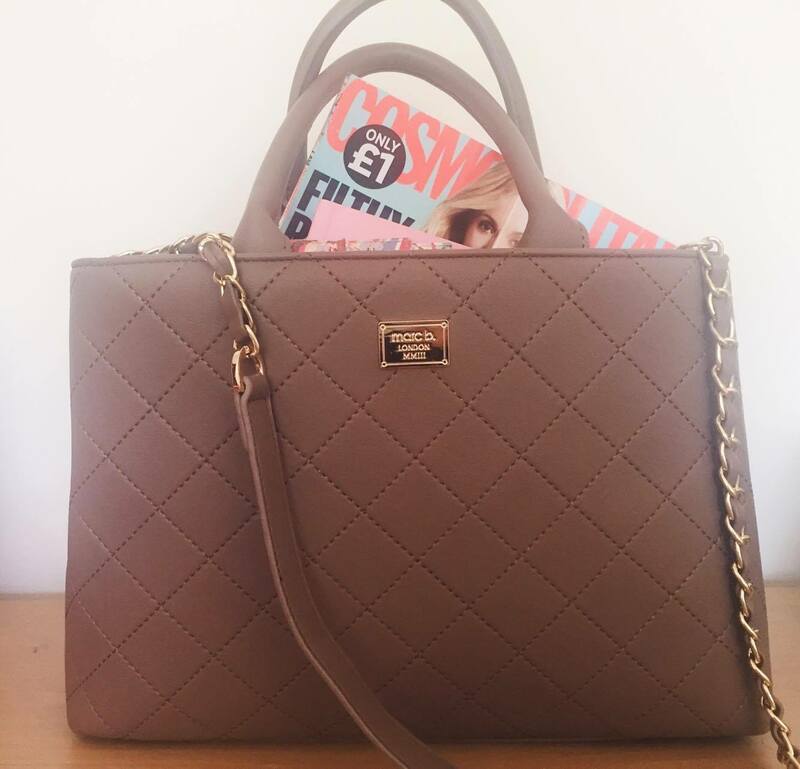 Lovely bag 💕The perfect neutral to go with any outfit, the size us ideal for fitting in flight essentials too! I rarely fly but when I'm on the train pretty much all of these would be ideal. I usually pack hand gel, tissues, chewing gum and some kind of fizzy juice because I get travel sick and my headphones. This bag is so beautiful I love the colour! Oh I love this bag! I haven't bought a Marc B bag in so long, but I went through a period where I was obsessed with them, and I literally wore every one of the bags to the death ha. And I have very similar travel essentials to you! I don't know how people travel without any form of entertainment. That bag is beautiful. I really don't travel often, but I never really need an excuse to buy a new handbag. Literally everything you have on this list is everything I take with me too. I do need to look into getting a new travel docs wallet though because mine is in dire need of replacing. The handbag looks lovely! Sturdy and sizeable. Great post! I can't get on a plane without a book - if it's a good one it makes the flight go so much quicker and it's the best excuse to switch off and read! This Marc B handbag with its three compartments sounds ideal for travelling! And it looks really stylish too, I'm not surprised you're such a big fan of it! I'm with you on the importance of a document wallet, I carry one where ever I go too!! OMG how cute is that bag!? You know I am definitely going to take a look at Marc B bags now even though I'm on a spending ban, hahaha. I agree with every single essential you've popped in there, great post! Perfect travelling list! It's pretty much what I haul around with me day to day (minus the travel wallet, I'm not on the run or anything)! I love having a note book and pen to hand. Old school writing just seems far more inspiring to me! This is my sort of post! I've got very good at packing light seeing as I do a lot of day trips in the UK or short overnight stays. I'd definitely say taking a tablet and something to read are essentials for me! I always try to keep travel sized bottles so I can refill them for trips!